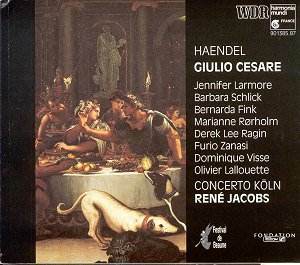 Giulio Cesare is the most recorded of Handel�s operas and the greatest. In fact it�s probably, Mozart�s apart, the greatest opera written before Fidelio. Ferdinand Leitner�s performance, in German, with a stellar cast has recently appeared and dates from 1965; Mackerras�s ENO recording with Janet Baker, in English, is also in the catalogue, though heavily cut. Then Jean-Claude Malgoire has also contributed a good performance on Auvidis E8558. But the leading performance on disc is now this splendidly realised traversal by an excellent and vibrant orchestra and outstanding young singers under René Jacobs. Handel seems to have been galvanized by the textual and dramatic possibilities of the work; breathtaking arias follow one after the other. Characterization is intense and the scoring is superb � divided bassoons, for instance, solo obbligatos for violin, oboe and horn and the deployment of a double orchestra. The whole work is studded with the possibilities of character development supported by virtuoso ornamentations and runs. The first thing to say about this set is that it presents a cohesive and unified view of this intensely moving and dramatic work. Jacobs has employed singers of technical excellence and sure instinct. Listen to the outstanding Cesare, Jennifer Larmore, in her first aria, Presti omai, executing perfect runs with burnished low notes � vibrant and alive. Her sense of dramatic intensity is everywhere evident and this is a notably successful performance. As Cleopatra Barbara Schlick deploys her voice to great effect. It hasn�t a huge range of vocal colour but she uses it with tremendous insight. In her aria Tu la mia stella, taken at a slightly slower than anticipated tempo she shows her beautifully appointed skipping runs, supported by an intense dramatic impulse. As Tolomeo Derek Lee Ragin, who was in the vanguard of the contemporary American counter-tenor movement, uses his very individual voice to complex effect, shading and colouring his tone not least in his famous hunting aria Va tacito, again taken slower than usual and featuring a rather outsize amount of ornamentation. Bernarda Fink is Cornelia and her duet with Marianne Rorholm�s Sesto is one of the highlights of the disc. All the parts, in fact, are well taken and all respond directly and vibrantly to the expressive and colouristic potential offered in the score. There are some points of weakness and in a masterpiece of this kind it could hardly be otherwise. I find the recitative after Cesare�s Almi del gran Pompeo too slow. Jacobs was, I suspecting, relating it to the succeeding aria, the rustic Non e sivago but it still seems to me to be a tempo-related misjudgement. There are one or two rallentandos which tend to jar � I�m thinking especially of Cesare�s aria Al lampo dell� armi - which nevertheless features such fabulously fearless singing from Larmore that it�s tempting to withhold criticism. Against that can be listed the very many virtues of the set � vigorous and subtle orchestral contributions prominent amongst them. Listen to the bassoon accompaniment in Che Sento? and the subsequent stabbing accents - in fact listen to Schlick�s singing here closely and hear her rolled "r" in "moriro" (to die) and her intelligent varying and shadings of volume and colour. Elsewhere instrumental and vocal textures are fully brought out and justice is done to the score. This is a first choice for Giulio Cesare and high praise is deserved by the soloists, orchestra, by Jacobs himself and by Harmonia Mundi.